The “stuff-it method” can be preformed by a homeowner. 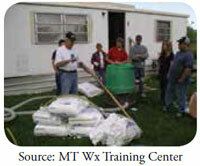 Special equipment and training is required to blow in insulation. Prior to 1976, there were no building codes for mobile homes. Walls were built with 2×2 or 2×3 studs. Wall insulation was usually a 1” fiberglass batt so there is often room for additional insulation. 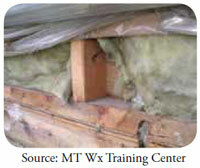 Sometimes the wall assembly included a vapor barrier or an exterior ¼” foam sheathing. Aluminum siding was installed in a variety of configurations. When it left the factory, this type of wall had an estimated R-Value of R-5. Over time that rating may drop to R-3 because of moisture penetration, air movement or other causes. The aluminum siding system was designed to allow for ventilation to keep the inside of the wall dry but essentially allowed air, sometimes cold and dry and other times warm and moist, to flow through the cavity degrading the structure and stealing heat. In 1976, US Department of Housing and Urban Development (HUD) passed new standards for Manufactured (formerly Mobile) Home Construction. Wall insulation level was set at R-13 in the northern Zone 3 climatic zone. Wall studs increased to 2x4s with 3-1/2” batt insulation. After 1994, wall insulation was increased to R-19, which necessitated a 2×6 wall cavity. The walls on most newer homes are similar to stick built houses and have wood or wood fiber siding. Almost all pre-1976 homes need re-insulating. With only 1” of insulation, overall R-value of those walls is around R-3. Insulating those walls could increase the R-value to R-12, reducing heat lost by about 40%. Heat loss and moisture damage from air leakage will also be substantially reduced. Because of the lightweight materials used in these walls, manufacturers included horizontal “rails” in the assembly. The rails, which are usually 1×4’s are notched into the studs and used as backing for the siding screws. They help hold the wall assembly together, but do complicate re-insulating the walls. 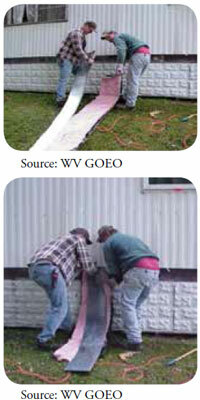 There are two methods for insulating mobile home walls, the “Stuff-It” method, and the “Blow-It” method. Both methods can work well depending on circumstances. The Stuff-It Method can be done by a homeowner. The first step is to inspect the wall assembly. Look over the exterior and observe the screw patterns and siding direction. Note any changes in the direction or type of siding. Screw patterns will help identify the location of framing and horizontal rails. Changes in siding may help determine the easiest access to the wall cavity. To inspect the interior of the wall cavity, six to ten feet of screws are removed at the bottom edge of the siding. Once removed, you can pull back the siding and reach inside the cavity as far as possible. Find the horizontal rails and any fire blocking. Identify the layers within the cavity; vapor barrier, insulation, foam sheathing, etc. Measure the depth of the stud cavity (1-1/5”, 1-3/4”, 2-1/2”, etc. ), and the thickness of the insulation. Note the rust on screws and whether the wood has degraded from moisture. If the stud is only 1-1/2” deep and has a 1” insulation batt, you may not be able to add additional insulation. There may be no extra space available, and inset rails may be in the way. In this case, re-attach the siding. In most cases though, extra insulation can be added successfully to the walls. The “Stuff-It” method uses a custom made 12 inch wide piece of quarter inch thick Lexan (a “Stuffer”), to shove vinyl encased R-14 fiberglass batt insulation up inside the wall. The Stuffer can be ordered from a local glass shop. One end of the Lexan has a slight, 5 degree bend about 8 inches from the end to facilitate bypassing the rails in the wall. If the test was successful, then remove the lower screws on the siding from the framing with a cordless drill. Start at one end of the home and proceed screw by screw along the entire length. You will need to pull the siding at least 12 inches away from the wall to install the insulation so you may need to remove a second row of screws. Remove any caulking as required. Lay a roll of vinyl encased fiberglass next to the home and unroll about 10 feet of it perpendicular to the wall. Place the Lexan stuffer on the batt. Fold about 6 inches of the batt over the top of the stuffer. Two people feed the stuffer and batt up into the cavity. One person feeds the stuffer with insulation past the lower rails and any wiring. Then, while holding the batt and stuffer with both hands, both people shove them up the wall until the insulation is jammed against the top plate. Slide the Lexan stuffer back down and out of the wall cavity. Cut the end of the batt off about 6 inches long, then fold the extra up into the cavity with the end of the batt against the interior wall surface. This extra material will compress to help seal the cavity against air movement within the wall. Stuff only those stud cavities that are a full 14-1/2” width, so that a full batt will fit tightly against the sides of the studs. You will typically find narrower stud bays adjacent to windows and doors and in the corners of the home. For narrow stud bays, fill the cavities with chopped fiberglass insulation using an insulation blower. When a length of wall is completed, re-screw the metal siding back in its original position. You should use the same screw holes, but will often need to install larger diameter and longer screws so the screws do not strip out. Insulating with the “Blow-it” method also works well and can be used to fill those narrow and odd sized wall cavities. Because a blower machine is required, this step is likely to be completed by a contractor. The first step is a trial run with a wall hose, be it a softer “winter” tube or a stiff “summer” tube. Depending on the wall cavity thickness, you may use a 1”, 1-1/4” or 1-1/2” hose. The contractor will use the biggest tube that will get past the rails, twisting as it is inserted in the wall cavity so that the beveled end of the tube can slide past the framing. The insulation machine material feed rate and air speed is set quite low. The contractor will watch the flow of material in the tube; when it slows down the hose is pulled down and out about a foot. The blowing stops when the bottom of the cavity is almost full. After removing the wall tube, the contractor will stuff a doubled up piece of fiberglass batt into the bottom of the stud cavity. Then the process is repeated in the next cavity. When the siding is re-attached, this packed insulation helps to prevent air flow in the wall cavity. When a length of wall is complete, the contractor will re-install the screws holding down the aluminum siding. As the homeowner, check to make sure the siding is counter-flashed to keep water out! The areas above windows and doors cannot be insulated with either one of these methods. One suggestion is to drill small holes on the interior paneling grooves and use 2 part foam insulation to fill the cavities. Also, be careful when blowing the walls so that the interior paneling doesn’t pop off with the pressure. Have one of the crew check on the inside occasionally. Insulation machine and appropriate hoses and tubes. Vinyl encased R-14 fiberglass batts. #10 x 1¼ inch hex head screws.